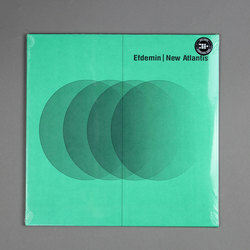 Efdemin - New Atlantis. Vinyl LP, CD. Bleep. Berghain resident Efdemin returns to the club’s Ostgut Ton label with what is possibly his most ambitious work yet. New Atlantis is the closest Efdemin has ever got to bringing together his techno productions with the forays into ambient composition and experimental electronics that have peppered his career. The LP is inspired by Francis Bacon’s novel of the same name - a work in which, four centuries ago, the writer conceived of ‘sound houses’ that contained instruments which could recreate the sounds of the universe. While Efdemin’s fourth LP might not contain every sound in existence, there is certainly a huge range of timbres on offer here. The title track, for instance, is a minimal techno piece that blooms from pensive synths into a gorgeous morning phase soundscape. Elsewhere on the record everything from hurdy gurdy, poetry, dulcimer and trance keyboards are employed in the service of discovering New Atlantis.